As you explore shapes with young children, you can use books to introduce rectangles. Simply choose a few rectangular books each day. Arrange them as you see fit on a large paper banner and trace the contour of each book with a highlighter or bright marker. 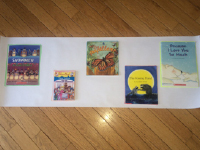 This method will ensure that the books are spaced out and therefore make it easy for children to see and admire them to identify the book they wish to "read". Let them look at the pages of their chosen book for as long as they wish. 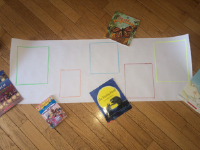 When they are done, encourage them to position their book inside the corresponding rectangle, on your banner. Here, the books play the role of puzzle pieces. Using this method to offer different books on a daily basis will provide children with the opportunity to discover new books. At the end of each day, don't throw your banner away. Hang banners from previous days on a wall and invite children to draw inside the rectangles. You can even invite them to draw a different cover page for the book they chose. Use this simple trick to make rectangles part of your reading corner and make books even more fun for children.